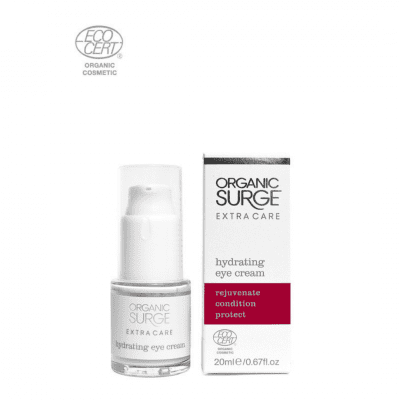 Organic Surge’s Extra Care range features natural creams, moisturisers, and lotions to reveal timeless, beautiful skin. Our new organic Hydrating Eye Cream gently rejuvenates and nourishes the delicate skin around the eye area. Excellent as a moisturising treat for delicate and sensitive skin. Organic Surge’s Extra Care range features natural creams, moisturisers and lotions to reveal timeless, beautiful skin. Our new organic Hydrating Eye Cream gently rejuvenates and nourishes the delicate skin around the eye area. Excellent as a moisturising treat for delicate and sensitive skin. Use it this way: Apply after cleansing with your ring finger (it’s the weakest), working from your lower outer eye clockwise for your right eye and anti-clockwise for your left, to cause minimal drag. For the very best results use Organic Surge Hot Cloth Cleanser for cleansing and then apply Organic Surge Intensive Smoothing Serum before using the Hydrating Eye Cream.